Selenium in food is found in many healthy foods and it is advisable to consume it daily. This essential mineral, known as the outstanding antioxidant is very poorly represented in the body (we can find it small traces) and therefore it is necessary to take it through food. What foods are rich in selenium? How to determine whether we have a deficit - the lack of selenium in the body, read the article. The most common symptoms of lack of selenium are nail changes on hands, muscle weakness accompanied by malaise, and weakness of the heart. Deficit of this mineral usually occurs due to inadequate nutrition (which is poor with protein), low intake of whole grains and fish. Therefore, the selenium in food is very important, also selenium deficiency affects our general condition and age. A lack of selenium in the body causes a weakening of the entire immune system, and is associated with a number of heart disease, infertility in men, due to difficulties in the production of sperm, problems with growth in children and the occurrence of nursing tap. Lack of this antioxidants occurs in people on dialysis, people who suffer from inflammatory bowel disease or have had a serious disease of the digestive organs, as well as those with severely diseased liver. Selenium deficiency can occur if you have smoked cigarettes for many years, excessive usage of alcoholic beverages, use of birth control pills for a long time or you have problems with digestion and absorption of food. Special attention to the amount of selenium must be taken into consideration by pregnant women, nursing mothers, and the elderly, as well as active athletes and people with weakened immune system, which is why selenium in foods is simply unavoidable. This powerful antioxidant is very much appreciated and is a real treasure for our health. When we add that the selenium in the body can be found in small quantities, it is completely clear that we should take selenium through food. So a simple solution from the whole story is that if we eat a variety of foods (vegetables, fish, and cereals) we will replace its deficit. Is it really so? Of course not. Another factor that we should not forget and that is why amount of selenium can be found in the soil and whether it is in optimal amounts or not. If you are worried by all of this do not worry, foods rich in selenium certainly exist and we need to eat diverse kinds of food which will prevent selenium deficiency in the body. Since it protects our cells from oxidation, mineral selenium will prevent the progress and development of many diseases (including those most difficult), in addition it will prevent accelerated aging of the skin or the muscles and brain. It is an excellent prevention of heart diseases prevents a sudden drop in immunity, it will successfully detoxify the liver and accelerate the production of thyroid hormones. significant role in the restoration of damaged DNA. Along with other useful minerals, natural antioxidant allows formation of cells of the immune system, which significantly increases the defensive ability of the body to fight infections and other diseases. Some recent studies suggest that selenium can prevent some nasty bacterial infection of the skin. Its influence is exceptional in preventing cardiovascular diseases. Additional amounts of selenium and other antioxidants, protect against heart disease and are good prevention against stroke. The incidence of cardiovascular diseases is greatest in areas where selenium mineral is least consumed, although this relationship is not well established. What is certain is that selenium in food lowers bad (LDL) cholesterol which is an important factor in the prevention of almost all diseases of the heart. Selenium in food and tablets is recommended for the prevention of cardiomyopathy (inflammation of the heart muscle) as well as in cases of illness, and muscle weakness. That the selenium in food is extremely important for our health, is very well known by asthmatics as evidenced by numerous recent studies. 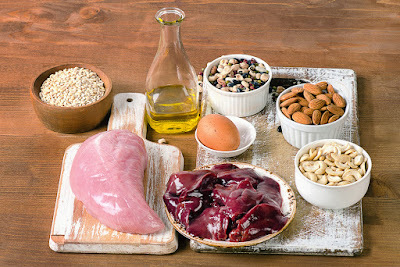 The results of recent scientific studies show that people with asthma often have a lack of selenium in the blood, but asthmatics who take additional amounts of this mineral through foods rich in selenium or in the form of medication, mitigate the unpleasant symptoms. Selenium mineral is actively involved in the metabolism of thyroid hormones, it is necessary to provide additional quantities of the minerals in the form of tablets if necessary, especially in case of reduced function of the thyroid gland. General recommendations of endocrinologist are to take selenium through food. The mineral selenium binds arsenic, lead, mercury, aluminum and cadmium, and ejects these toxic elements from our body. This effect is enhanced if at the same time you are taking manganese, calcium, magnesium, zinc and selenium. Also a long-time smokers should consume as much as selenium in food, because it helps discharge heavy metals from the body that long term smoking caused. Which foods are rich in selenium? We have found out that our body does not produce its own selenium, and at the same time we pointed out its importance for our organism. Where can we find selenium in food? We can find it in brewer's yeast and wheat germ, liver, egg yolk, butter, soy, fish (tuna, cod), seafood, garlic, whole products whole grain, and sunflower seeds. These are all good sources of selenium, but this essential minerals is by far the richest in Brazilian walnut. However, the quantities of selenium in food varies and depends largely on the level of minerals in the soil in which these foods were grown in. The best thing to do is to combine and put together a healthy menu or consult a professional. Patients suffering from hypothyroidism need to include it in the diet, and eat foods rich in antioxidants primarily selenium to keep the thyroid gland in shape. Who should not take selenium tablets? For preparations of selenium, contraindications are general, so selenium should not be used by people who previously were poisoned by it or those who are allergic to the preparations of selenium. According to available sources, the interaction of minerals with other drugs have not been the subject of major and significant study, however, mentioned are some effects with the drugs that affect blood coagulation, those for lowering blood cholesterol levels and barbiturates. The best recommendation is that the patient, if with regular therapy is planning to take selenium pills, to notify the doctor in order to avoid later undesirable interactions. Is selenium in food and tablets harmful? Doses greater than 400 milligrams a day can be toxic if taken for a long period of time. There may be side effects such as disorders in the growth of nails, skin rash and changes in the functioning of the nervous system.